We offer a 14 Day Free Trial with Unlimited Functionality. Great software, easy way to share documents and save time organizing files! Pros: You can just upload all documents to the same place, and have your customers also uploading. Everything will be there, so next time you are looking for something, you won't have to go searching everywhere. The best of it all is that if you make a mistake when requesting a document, you can go back and edit it. It's so easy to manage files and add notes to it! Also, you can communicate with customers through it. Did I mention that it also transforms files to PDF automatically, making it easy to access through your phone or notebook? This is the one software we need to manage our files. Very easy and simple to use. Cons: Sometimes it will take a little while to upload files, but that could also be an issue with our connection. Let me also note that it is very rare to have an upload or download that will take long to complete, but it does happen occasionally. 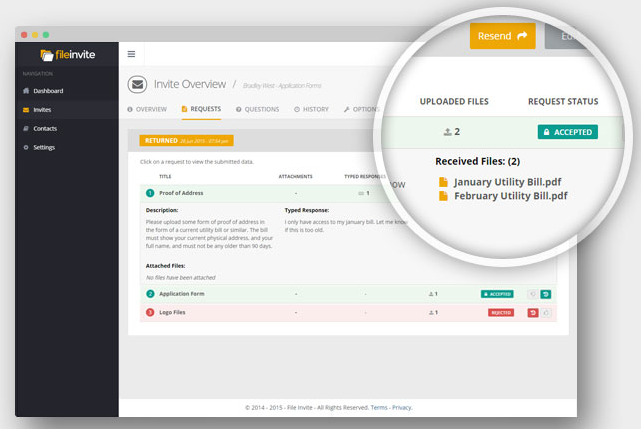 Overall: Being able to manage files received by customers and also send them files with notes. The way we are able to communicate through the software is also awesome. I do recommend this file to all business owners, you will always need this type of software. Great value for the price! Easy to use and an effective way to improve productivity! Pros: The best feature of this software is its user interface. It is easy to set up templates and it offers you sufficient customization. I have used similar platforms before and although they allowed for some customization, I found that they imposed several limitations of how may customizations you were allowed. For example, I could include a description, but the number of characters allowed for the description were extremely limited. This made it difficult to provide all of the information that the customer needed to know about that specific request. I also eventually left other software providers behind because they kept increasing the price with very little improvement in their platform (and in some cases, less functionality for a higher price). I believe that this platform is a fair price and depending upon the enhancements down the road, I would consider paying more for additional functionality. Hey Chris, thanks for the awesome review! We have now have signature capture that you can use in beta, let me know if you'd like us to turn this on for you. We also have Zapier integration which may help down the track with your automated reminders and invites. Pros: Everything is in one place and I don't have to remember to follow up the clients. Cons: Can't reply to in-app messages by email. Overall: This software was a lifesaver for our workflow! 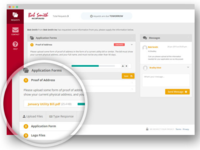 We used to spend hours chasing clients for the documents we need from them to start their application, not anymore. This software does all the chasing, and keeps everything in one place. I can now see exactly which documents have been sent to us and which ones we are still waiting for, and they're not all scattered through my email inbox. I absolutely LOVE the automatic dropbox sync. As soon as the client uploads their documents they instantly show up in an neat and tidy folder on my computer. Feedback from our clients using the software has been great, and we have noticed a massive increase in the speed that they return us the files too. Recommendations to other buyers: Make sure you set up cloud storage sync with Dropbox or Google Drive in your settings. Huge benefit. Pros: FileInvite keeps all the application and data collection process in one place, but more importantly I am able to arrange the requests to suit the type of lending - ie: first home buyers, Welcome Home Loans, property investors, non-bank lending etc and this way I can collect what is needed. It also allows me to add detailed instructions for each piece of information that I require. Plus collecting bank statements is now easy and I get the information in the correct format - love this add-on. Best of all FileInvite converts everything to pdf format which saves a lot of frustration with trying to get every bit of information sorted out. Cons: There is not much I don't like about this. I guess it would be good if the mobile number for texts could be automatically be changed to a +64 prefix as I keep forgetting. Pros: I loved the fact that all the documents that I needed from a client were not only sent to the client in one actionable file but also that the clients had a clear visual of what they had and hadn't sent. The auto follow ups for documents not yet received was also a valuable time saver. Clients have given me nothing but positive feedback on the ease of use from end user experience as well. Cons: Nothing to fault with the product at all. Overall: Very easy to work with, excellent customer service and always available when needed. Thanks so much for the review Renee. Having a good idea where everyone and every file is at can be handy, and automatically following gets results. We are so glad that clients are finding it easy to use as well. Automate The Entire Process of Data Collection from Clients. Pros: FileInvite makes the process of obtaining data from customers/clients simple and faster, as it facilitates the automation process. Again, FileInvite has a secure interface, and this ensure data safety is maintained. It is also easy to sync the uploaded data to other cloud storage platforms such as Drive by Google, Dropbox, among others. Cons: The software worked effectively as we intended. I found no problem with FileInvite. Overall: The software is impressive, and it makes us collect the information necessary from our clients. Pros: first, the software can use the name you set up the template so after download, don't need to spend too much time to rename the file, second, if client upload the picture, you can choose to download the PDF one, and save time to convert the picture to PDF. Cons: If client upload all the files and then you decide to download all the files, it will save as one merged PDF file, which has ID, bank statement, everything together, then we had to manually separate them, and rename, also under one template like bank statement, can't choose only download the merged docs for one template. Overall: save us time and it will sending email to reminder the client and we don't need to manually f/up all the time. Hey Pat, thanks for the awesome review and feedback, we take all comments on board and helps us make fileinvite even better for future releases. Pros: I like the fact that with FileInvite, everything is placed in one position, which means, one will not spend all of their time following the clients, Again, FileInvite has a friendly user design, which makes it easy for the user to customize and develop different templates. Furthermore, it is possible to upload all the documents in one file. Therefore, FileInvite is a significant tool for collecting the required information. Cons: Sometimes, FileInvite takes longer when uploading files. I wish the vendor could make it faster, by customizing it to fit all the customers' needs. 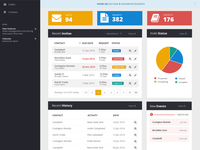 Otherwise, FileInvite is a reliable tool for organizations. 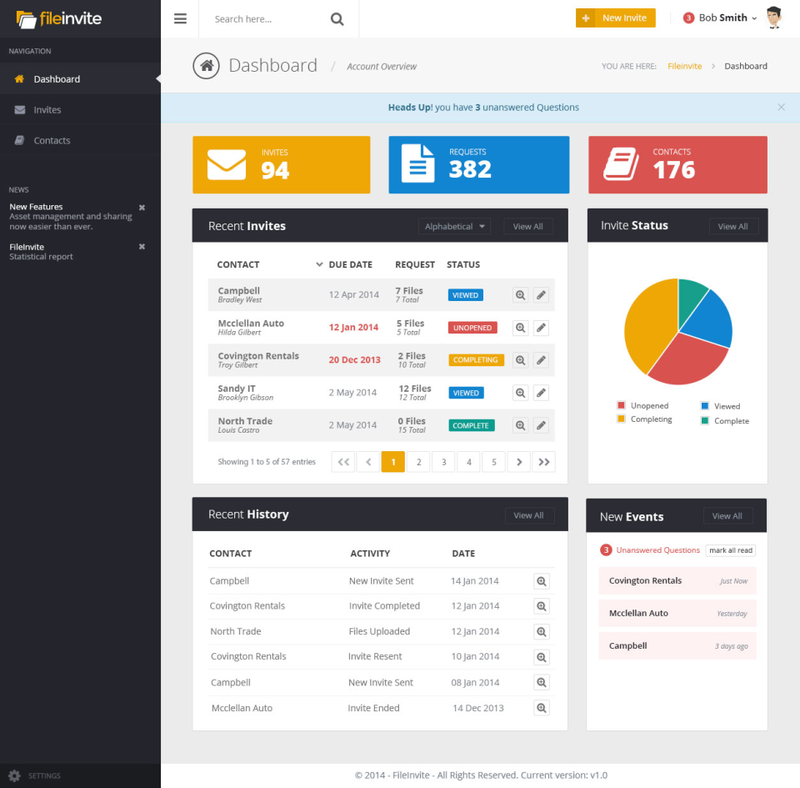 Overall: FileInvite has assisted us to manage files and information received from our clients. The item is user-friendly and very stable. Pros: Keeps all the documents I need precisely where I need them and allows me to create my own templates. Cons: Needs to add the functionality for two people to sign the same document. Would like more options for sending reminders. Cons: We still need to review each document received to check what it is if the client has not labelled files clearly. Thanks for the awesome review Tony! Did you know that you can preview the documents that have been received in the invite > requests tab. Hope that helps! Pros: I like the fact that you can add your own logo so that clients are not confused by where the request is coming from, it keeps a continuity of branding. I love the fact that clients are getting text messages to let them know they have an invite, or that it is now due today. I like that I can create templates. Cons: Not able to link to Bankstatements.com.au however I get around it by putting my link under the request Bankstatements for people to click on. I think it would be a good idea to have the ability to ask questions for clients to respond to in a check off way, sometimes it is not a document that we need but the answer to a question, once they respond it can be checked off. I would like to have a record of the invite, what was uploaded, down loaded, comments etc so I can add to my file separate to FileInvite for compliance reasons. Great document collection tool - makes the process easy to collect documents. Pros: Easy to implement. Customized branding for mid and higher grade applications. Works with several applications and easy API integration. Nice product for price. Good for single, team or corporate application. Cons: White Label in highest grade only. Needs ability to set workflows and timed actions. Needs an unlimited Invite option. Overall: Ease of use. Streamlines the document collection process. Speeds up the document collection process. Pros: Facilitates collection of different documents very easy. Allows to collect different information, efile it and forward to the clients in an efficient manner. Like the automated reminders. Cons: Would be very helpful to have some additional features added, like a time stamp, for a example. Overall: I like this application and use it on the regular basis as part of conducting business. Fantastic - Simple to use and an easy way to gather documents. Pros: I like how the files convert to PDF and automatically save to my laptop. Also, the ease at which clients can upload information, from their smartphone or computer. Cons: Would like files to sync with OneDrive and Box. Also, the speed throughout the site can be on the slow side. Hey James, thanks for the awesome review! We stoked that you're enjoying the ease of use for yourself and your clients. Pros: The on-boarding process as a new user is very good with helpful videos. The software is easy to set up and amend. The option to upgrade to custom branding presents a professional image to our customers. I feel this is a much safer system than allowing customers to send their documents to us via unencrypted emails. Cons: I would love this software to integrate with Timely who provide our office diary. I would also like the option for a file invite to expire and be deleted from the providers server after a set time. Overall: Much greater security for sending and receiving customer information , both documents and messages. A more professional customer experience. I love Fileinvite - finally my world is easier and clients know what to do! Cons: I do love this software - would like it to be a bit cheaper however the professionalism it shows to my clients is worth it - I have even put other advisers onto FileInvite. There's enough work for all of us! It has streamlined the document exchange with my clients. The sync feature, saves us hours of time! Pros: Easy to use, they have a great and responsive support team. 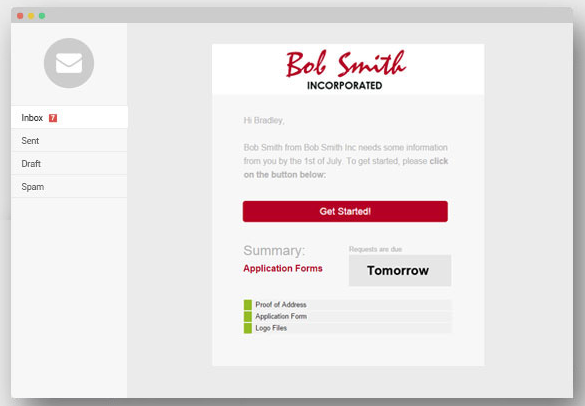 The client interface is allows for an easy way for clients to upload documents. Overall: It is a huge time saver! Excellent platform, easy to use. Does what it's supposed to with zero extra nonsense. Pros: Easy to use, simple clean interface, practically zero learning curve. Clients like it and understand it. Cons: Not much. Need to remember to turn off the automated email reminders to the client sometimes. Early on I had an issue adding new contacts but I figured it out. Hey Michael, thanks for the awesome review! We're stoked that you and your customers are enjoying using the fileinvite software platform and that it's adding great value to your business. Pros: Its ease of operation, easy to use. Clients like it. 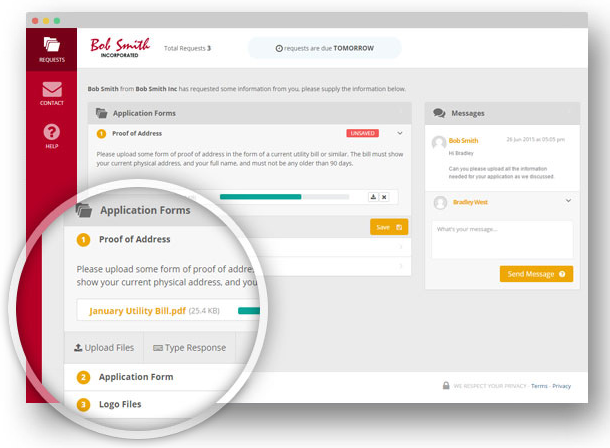 Once you load your requests, FileInvite follows up the client by email or sms. You get regular updates as to the progress. Clients are happy knowing that their information is being uploaded in a secure environment. Cons: As yet a broker app is not available and the site is not mobile friendly. I understand they are working on it. Overall: Makes our job easier by chasing up documents on our behalf. Looks more professional, clients are impressed. Pros: Easy to use. Safe for customers to upload their information. Easy to explain to customers exactly what we want from them. Messages can be sent back and forth if their are any questions. Cons: Haven't found anything I dislike. Its easy to use. It's safe to use. Customers have embraced it completely. Overall: Ease of use. Safe to upload documents. We can customise or just send already customerised templates to customers. Hi Lynne, thanks for the awesome review! We're glad that you and your customers enjoy using the platform! Pros: You can just upload all documents to the same place, and have your customers also uploading. Everything will be there, so next time you are looking for something, you won't have to go searching everywhere. Does as its says - document collection on autopilot! 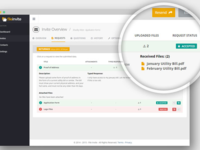 Pros: Its intuitive and simple to use for both our business and clients. The setup was very easy and our team adopted it very quickly without mush fuss. Overall: Saves us a lot of time!!! Hey Clinton, thanks for the awesome review! Yes we have a full rebuild of the framework in the current development road map which will greatly speed up the platform processing times. Pros: I love the extra follow ups that it does automatically. It has made my follow ups with clients very easy to do. Cons: The signature feature is kinda broken. The signature never appears on the right spot and the box can't be resized. People just type in their signature as well and there's no way to disable this :( Please see RightSig for a good reference point. I have yet to come up against anything detrimental to its general functionality. Cons: Still working with the FileInvite team on a few recommendations so nothing worth mentioning yet. Overall: The sales and support has been wonderful so far, and I don't see any reason I will have much support demand once all of the little nuances have been addressed. Overall: Simplify the contact with clients and all files are kept out of my inbox where they can be missed, and so keeps things organised and clients have an easy set of instructions on what to do. Pros: I am working with tens or even hundreds of files on daily basis, transferring back and forth. FileInvite makes it all easier and painless. Cons: I haven't found any cons so far, it's a brilliant solution for file transfers. Thanks for the review. It's great to see we can be a solid part of your workflow for collection and transferring files for translation. Pros: The fact that you can receive larger documents all at once, as opposed to having to break them up by sending via email. Cons: No down sides that I found. It all worked for what I needed. Pros: I love the "set it and forget it" model. Projects that used to take hours of follow-up to get all the necessary components are now done with a minimum expense of my time: maybe 3 minutes to set up, and another few to download everything once it's returned. The software takes care of sending reminders to my collaborators, and I get to maintain better relationships. Cons: The menu has a lot of options that are symbol-based, so it can be hard to know where to go for what you need. Pretty quick learning curve (especially if you're using it regularly), but frustrating only in that it feels more difficult than it needs to be. Overall: Hours of my time and focus back. Pros: The program was on a trial basis. We are a small office and wanted to see if our clients would be responsive as they are an older generation. The software is easy to use. Cons: The software is good but again due to the age of most of our clients it was difficult to work with the clients to educate them on how to use the program. Overall: If we had a younger audience and computer savvy clients this would have worked wonders for us but unfortunately that is not currently the case. 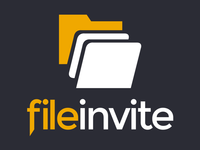 Pros: FileInvite is an easy way to share the documents and it also saves time in file organization. I can keep all my documents precisely where i need them and I can make my own templates. The best feature of this software is its user interface. It is very easy to use and it is an effective way to improve productivity. Integration with Google Drive is also very convenient. The software is easy to set up and amend. Cons: The only thing I found negative is that the site is not mobile friendly but I know the FileInvite team must be working on it. Overall: Its a great software and my experience with FileInvite was closer to satisfaction. Pros: Saves me time collating documents. Integrates with bankstatements.com.au which provides a seamless experience for clients to provide statements. Cons: Some clients have complained that it is sometimes slow to upload. Other than that everything is fine. Pros: Alerts and Advises Me any time there is activity.... Ability to use is simple. Keeps Data Manageable. Cons: Not liking the amount of clicks you need to go thr ough to get to the path in their efile under our drop box. Cons: The only donw side is after a fileinvite is closed it deleted after a while. So when clients say they have uploaded and you have saved all the doucments its hard to reopen to show them what they sent. Overall: This program saves so much time when it comes to sorting and converting docs to PDF. Pros: Setup the list of required documents needed and send, doesn't get any easier than that. Easy for client to understand what they need to do , Access via the smart phone is a plus as well. Hey Adrian, thanks for the awesome review, we're stoked you're getting great results using the software! Pros: Easy of use for both the user and the client. Good value for money. Makes tge business look very professional. Cons: Want to be able to get branding but not go premium as i dont wanted the other stuff. I dint need link to cloud or other users as work alone. It is easy to use and has reduced my workload. 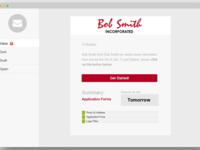 Pros: Templates make it easy to send out requests quickly and it helps keep documents organised for filing. Hey Tracy, thanks for taking the time to give an awesome review! We're glad fileinvite is working great for you to organize your filing and reduce your workload! 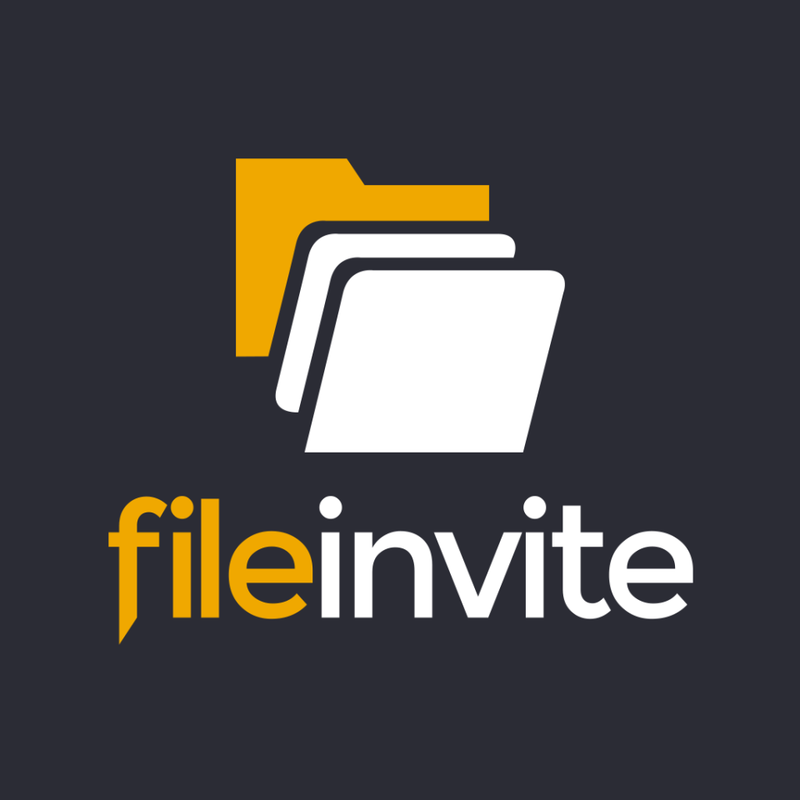 Your feedback helps us make fileinvite even better! Overall: This has made life a whole bunch easier, being able to be hands off in the process when collecting client collateral is key. Pros: We're a company that has to deal with A LOT of paperwork from prospects and clients so this makes a world of difference for us -- to know the status of every single file we need. Thanks for the review Camille. We'll add a Hubspot integration to our list and explore. Pros: FileInvite has made collecting important information from our clients so much easier. We can send a email right to them asking for specific items and they can send right back fast and secure. Cons: Price is a little expensive to just receive files. Overall: Overall the product is good and helps our agency collect information necessary.